Erasmus University Thesis Repository: Container seaport selection criteria for shipping lines in a global supply chain perspective: implications for regional port competition. Container seaport selection criteria for shipping lines in a global supply chain perspective: implications for regional port competition. Shipping lines are heading for a more value-added business recent years – integration into global or regional supply chains. Most of liner shipping companies are observed involvements in this trend more or less nowadays. Under this circumstance, shipping lines’ port selection criteria in the Northwest Europe – Asian route may differ from previous criteria. 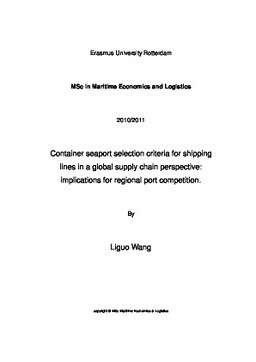 This thesis uses Analytic Hierarchy Process (AHP) to examine relative weight of eight selective port selection criteria (port location, water draft, size of hinterland, feeder services & intermodal connections, cargo volume, port charges, port efficiency and IT ability) among port of Hamburg, Rotterdam, Antwerp and Le Havre. Raw data is collected via distribution of questionnaires to various shipping lines operating in Northwest Europe – Asian route. The modal results show that port location, feeder services & intermodal connections, size of hinterland and port efficiency are the four most important port selection criteria. Port competition and development is also needed to re-think since the change in port selection criteria. Several competition suggestions are raised in favor of port’s integration towards an element in supply chains.